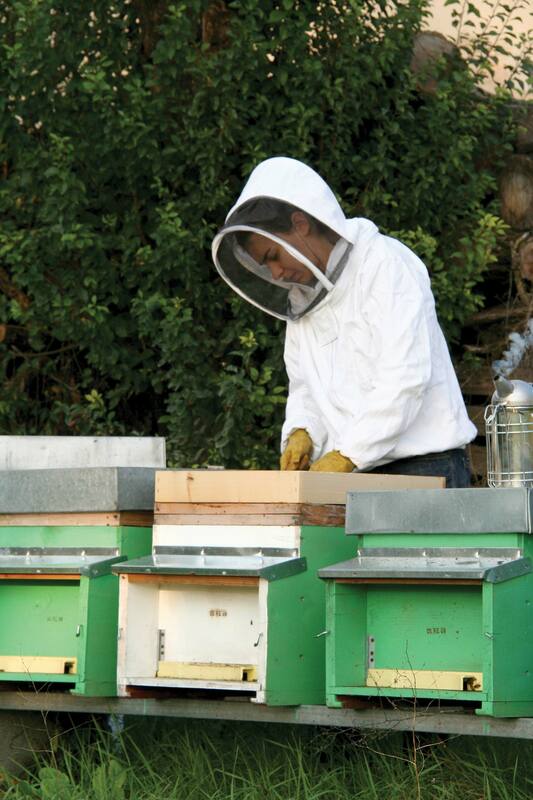 We have a small production, only 10 beehives. 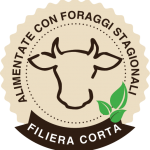 For the first part of the year, the honey is produced in our farm, then we move the apiary to Castellaro, 800 meters above sea level, next to a chestnut wood where, when the season makes it possible, we get a fabulous chestnut honey and an excellent mixed flowers one. 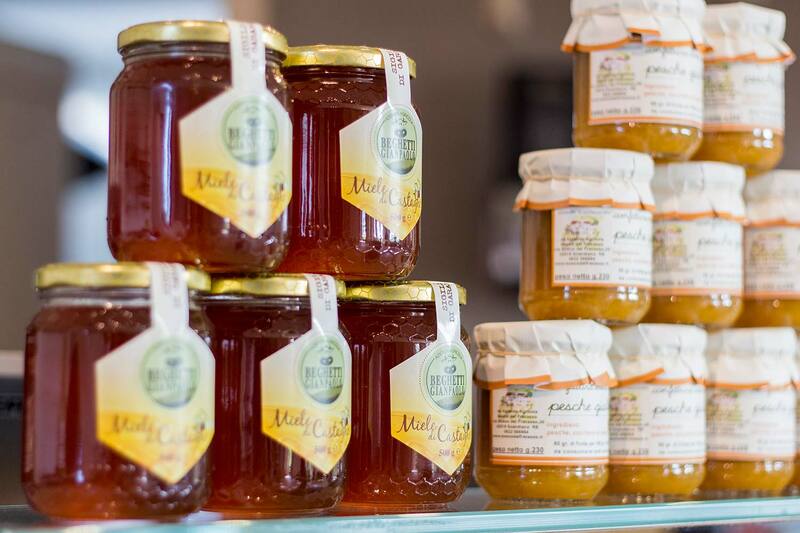 Our honey is a gift of nature, 100% natural, cold worked to keep all its properties intact. We use only organic wax and treatments permitted by the Bio protocol. 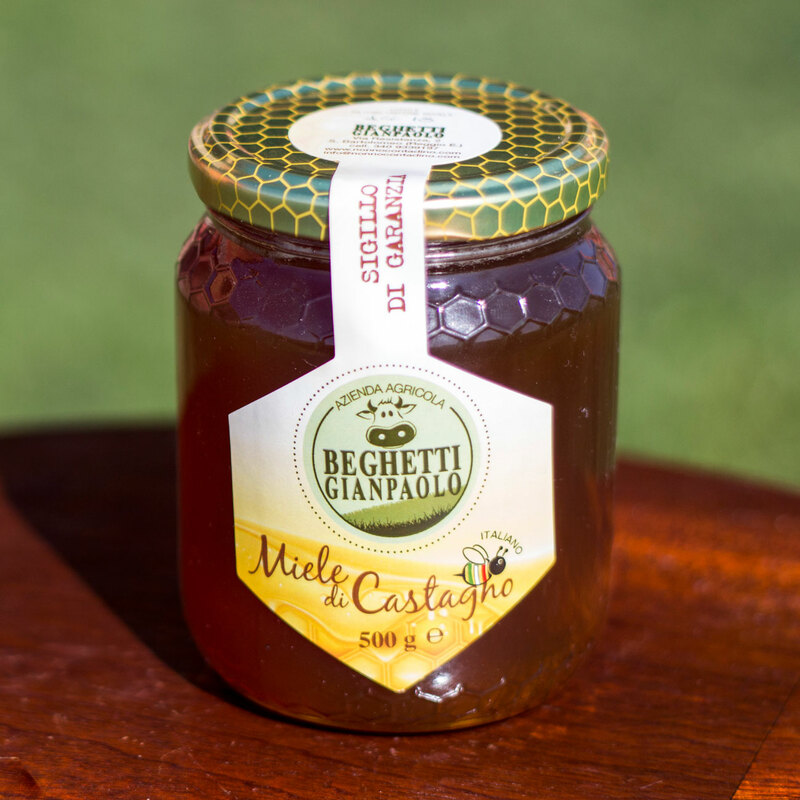 It is the most known honey and, in Italy, among the most appreciated. 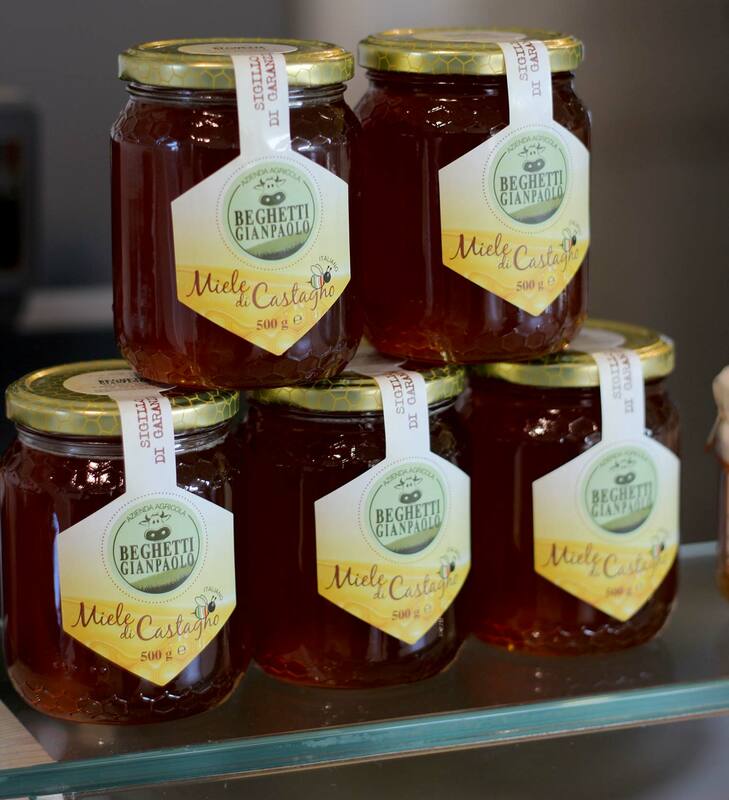 It is the clearest variety of honey, with its almost transparent crystalline colour. As it doesn’t crystallize and for its delicate taste, it is considered the sweetener par excellence because it does not alter the flavours. Rich in fructose and pollen, it is considered a mild laxative, it has detoxifying properties for the liver and it is also an anti-inflammatory of the respiratory tract. Great for children, from the first year of life it is recommended in addition to milk. Honey with a very strong and bitter taste, which does not solidify. It is rich in minerals and fructose. Recommended in all cases of poor circulation, anaemia, fatigue and respiratory diseases. The bitter taste and strong aroma do not make it suitable for sweetening, but rather to flavour or to eat as it is on bread, possibly with butter. Recommended with aged cheeses. Very fragrant honey with a strong taste and medium sweetness, which leaves a bitter aftertaste. Crystallizes in the short term, assuming a grainy consistency. 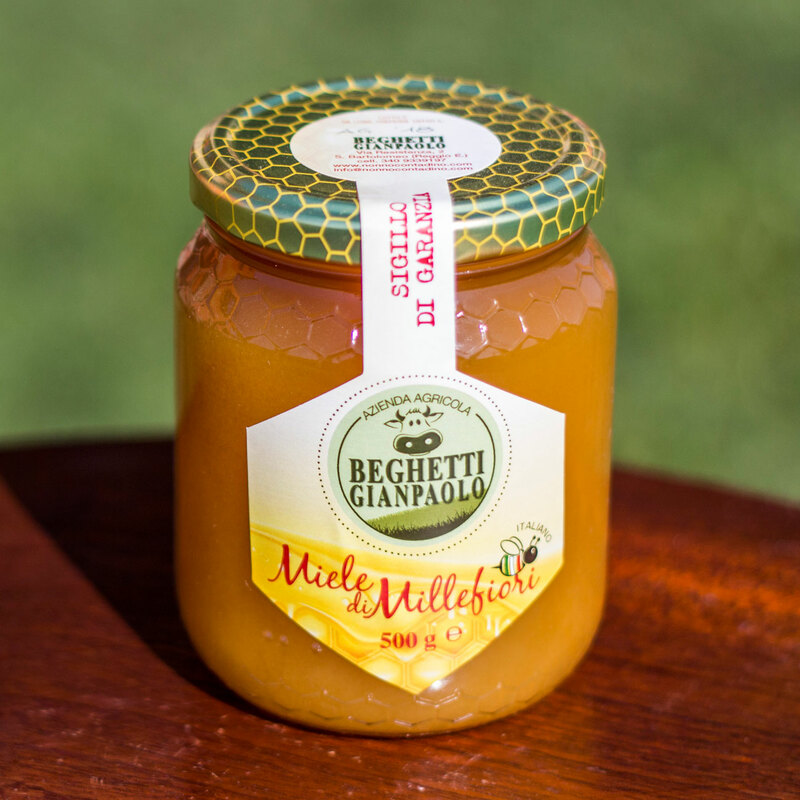 It is excellent paired with dishes cooked with sage, baked fruit or a good Parmigiano Reggiano. ...honey is the product that the domestic bees create from the nectar of flowers or from the secretions coming from living parts of the plants or on them. They stock it, transform it, combine it with their own specific substances, store it and let it mature in the honeycombs of the hive. Only bees (and a few other insects similar to them) make honey because only they are the only animals that feed on nectar and pollen that need to accumulate food supplies. They solve the problem by transforming the fresh summer food (the nectar harvested from the flowers) into a long-life food, through the operculation. They collect the tiny droplets of nectar and assemble them into the right amount to be transformed. The raw material is nectar, a substance of plant origin to which the honey owes its characteristics and its taste. Did he really say it? ...It does not matter, what matters is to know that bees are pollinating insects: grasses and arboreal essences need to get the pollen in order to reproduce, and bees carry out this function. The humid secretion that the plants emit, the nectar, fluid, rich in polysaccharide sugars, is in fact a trickle to attract bees in order to be fertilized with the pollen that they have collected on the flowers of the same variety. Bees are responsible for around 70% of the pollination of all living plant species on the planet, guaranteeing about 35% of global food production. Many consider this insect a threatening and not very useful one. In fact it is indeed a species to defend and preserve for its usefulness and for the fantastic products they offer us with their hard work, in exchange to a little care. Today, unfortunately, beekeeping is made difficult by the spread of harmful products in agriculture,by the disappearance of stable meadows and the diseases affecting these insects. This is why a true farmer, even if he does not choose organic production, can adopt cultivation techniques that respect biodiversity. The process of transformation of nectar into honey begins immediately after the worker bee has stored the nectar in the frame and transported it to the bees placed at the entrance of the hive, which will begin the process of transformation. The richer the nectar is in water content, the harder it becomes to transform it into honey. At each step the product is enriched with enzymes secreted by bees, which collaborate to the transformation. The obtained liquid, still too rich in water, is stored in the cells where the ventilating bees will bring the humidity level to 17% - 19%. As soon as the honey is ready, the bees will seal the cells with a layer of wax (operculum), which becomes an insulator, preventing it from absorbing moisture from the external environment, with the risk of fermenting. - those that are used exclusively to sustain the colony in the most difficult periods.